Sandwiched between Kensington and Shepherds Bush is the pocket sized microclimate of Holland Park! 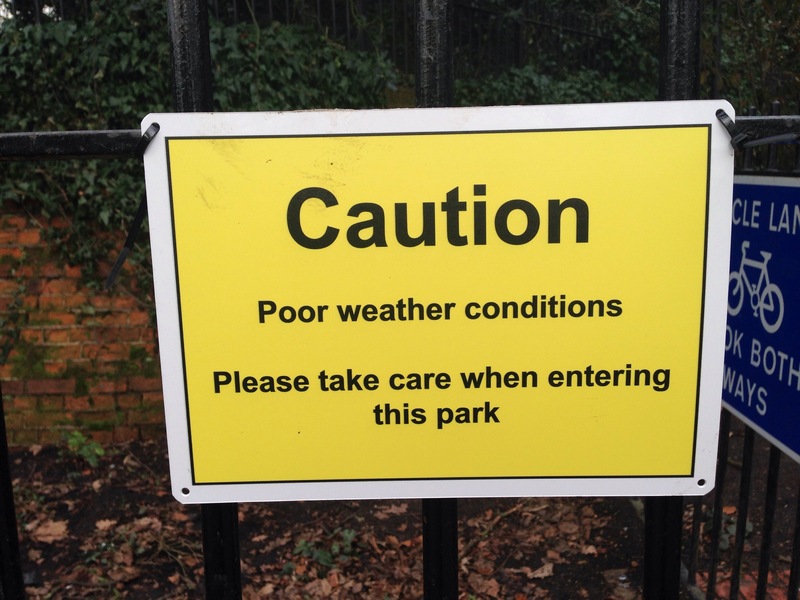 I walked through it today, taking my chances, after seeing this sign at the entrance, thinking I’d have an adventure. Blizzard? Ice trekking? Biblical flood to cross? A hurricane to sprint away from? But all was calm and quiet and reassuringly urban. The only adaptation I had to make for the weather conditions was to remove my scarf because it was rather mild. I was going to run today but didn’t fancy it much. Then walking home from dropping my bike off for its service I noticed how bad the traffic was and hatched a plan. Rather than squeezing in a short run before getting changed and driving to meet people at lunch time I would bin the run, leave early for my meet up and walk there. Squeaky brakes (which they told me was quite normal) now cured. Categories: cycling, fitness, Janathon | Tags: Holland Park | Permalink. A park with its own micro climate. I love it.